The amount of venture capital raised by bitcoin startups this year has already surpassed the total amount raised in 2013 by more than $27m. Announced today, the startup’s second Series A-1 funding round took $20m in total. Spearheaded by Index Ventures and Greylock Partners, the round also included Emergence Capital Partners, venture capitalist Yuri Milner, PayPal co-founder Max Levchin and former Yahoo! CEO Jerry Yang. Back in March, Xapo’s initial round was led by Benchmark Capital, Fortress Investment Group (FIG) and Ribbit Capital. At the time, it was the second-biggest funding round in the bitcoin space. Blockchain announced that it has secured a record $30.5m Series A funding deal, co-led by Lightspeed Venture Partners and Wicklow Capital. 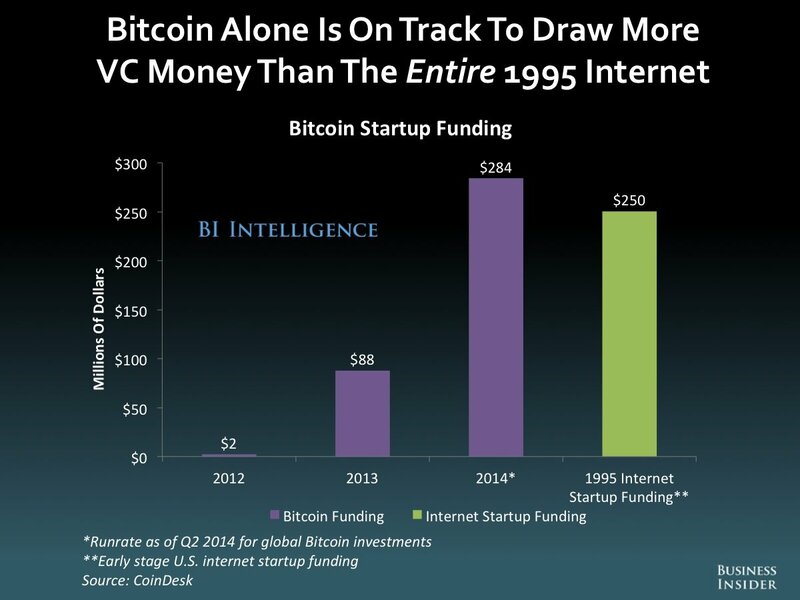 Bitcoin Is On Track to Draw More VC Money Than the ENTIRE 1995 Internet Startup Funding. Coinbase raised $75 million in the single largest venture-capital fundraising by a bitcoin-related startup. Stealth bitcoin startup 21 Inc, formerly 21e6, has announced new information about its funding history, staff members and investors, revealing it has raised $116m in fundraising over multiple rounds. In a new interview with the Wall Street Journal, 21 CEO Matthew Pauker indicated that Andreessen Horowitz, Data Collective, Khosla Ventures, RRE Ventures and Yuan Capital are among the firms that have participated in the company’s funding rounds. Dropbox CEO Drew Houston; eBay co-founder Jeff Skoll; Expedia CEO Dara Khosrowshahi; PayPal co-founders Peter Thiel and Max Levchin; and Zynga co-founder Mark Pincus have also invested in the startup. Perhaps most notable is the involvement of Qualcomm Ventures, the venture capital subsidiary of the global semiconductor company that designs and markets wireless telecommunication products. Pauker told the news source that 21 aims to leverage Qualcomm’s production capabilities to develop a suite of undisclosed products to be released in the coming months. Co-founder Balaji Srinivasan, a partner at VC firm Andreessen Horowitz, compared the ambitions of the project to the development of 56-kilobit Internet modems and wireless Internet towers, suggesting a long-term vision that helps bring bitcoin to consumer households. The figure would top the $106.7m raised by Coinbase to date through its four public funding rounds. 21 raised $5m in venture capital in 2013 as 21e6.